1/ Low Carb "Sloppy Joe"
This one's a surprise. I wasn't even going to make it when I read about using cauliflower in the base but... I'm glad I did. The mixture of riced cauliflower and grated 'hard' mozzarella cheese needs a knife and fork (it's a bit messy in your hands, but possible) and it is in the words of my daughter 'scrumptiously tasty'. ...or 2/ Higher Carb, Gluten-free "Crispy Pete"
To be able to hold it more easily in your hands, you need to add a replacement for the wheat flour. Commercial options for gluten-free pizzas use tapioca, rice, potato or cornflour and in so doing, are very carb-rich which quickly spikes your insulin. 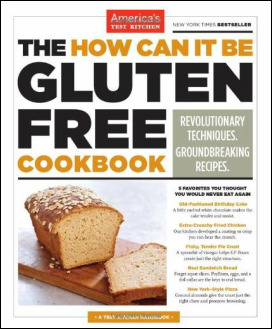 That being said, the recipe from the How Can It Be Gluten Free Cookbook is by far the best and I have served it without saying it's gluten-free with much success. Mix in some garbanzo bean flour (chickpea flour - also known as Gram flour) almond flour or ground golden flaxseeds to add both substance and taste. When using ground flax seeds, remember to drink lots of liquids - they tend to soak up the H2O. The secret of making a great low-carb pizza base that holds together well is in reducing the liquid in the cauliflower and letting the egg and molten cheese provide the "glue" when it's cooking. Time for Crispy Pete to make his credentials known. He's a whole lot of carbs heavier but he's home-made healthy, 100% gluten-free and the closest you can get to durum wheat pizza dough - without the wheat! Crispy Pete's secret ingredient is 'psyllium husk' which strengthens the proteins in gluten-free flour so that it can better trap steam and gas during baking... making it more bread like. You can easily find it in healthfood stores or on-line; it's cheap and well worth the purchase. Psyllium husk is a shrub-like herb most commonly found in India and you only need small quantities to create the right pizza dough texture. In larger quantities, it is often used as laxative and is also renowned for it's high fibre content. Pulse the cauliflower in a food processor until it looks like snow and resembles the texture of breadcrumbs or fine couscous. In a microwave safe bowl, cook the mixture on high for 4-5 minutes. Let the mixture cool before placing it in some cheesecloth and literally twisting the top to squeeze out the water (Keep this liquid for adding to a soup). Wait a few minutes for the cauliflower mixture to relax before giving it a final squeeze. You will have reduced the weight by one third. Mix together the cauliflower and all the other ingredients very evenly to form two dough balls. Cover a baking tray with baking paper and after spraying a light layer of olive oil, place your dough ball in the middle and form it into a 25 cm circle, about ½ cm thick. Bake in the oven (pre-heated to 250 °C) for 11-15 minutes until the surface begins to turn golden brown. Remove from oven, and at this stage, you can let the pizza crust cool, cover it in cling film and freeze it for up to a month. Alternatively, march ahead using the flip side to add your toppings, before placing it back in the oven (still on baking paper) for 5-7 minutes or until the cheese is melted and bubbly. I use my slow-cooked tomato sauce as a spreadable base, which has been portioned and frozen. 'Crispy Pete' is adapted from "The How Can it be Gluten-free Cookbook" published by America's Test Kitchen. A word of warning: measures are not metric in this book.